Includes the headset, 2x wireless controllers, 2x two base stations for room-scale tracking. Uses 2x Lighthouse Base-Stations for room-scale tracking of headset and controllers. 1m Breakout Box, 4.5m cable, Hardware adjustable IPD, Proximity sensor and Camera. Includes 2 positionally tracked motion controllers each with a touchpad and trigger akin to the Steam Controller, two face buttons, and 2 grip buttons. 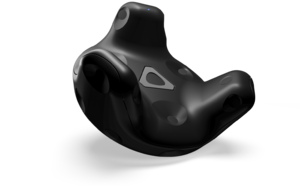 The Vive tracker is a standalone tracking device to track real world objects in VR, such as a DSLR, bodyparts and specially designed accessories like the Hyper Blaster Gun. 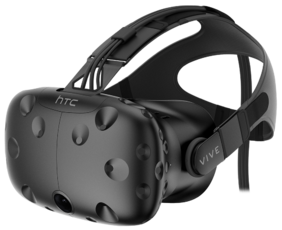 Allows HTC Vive owners to play Oculus exclusive games. GitHub page with install instructions and downloads are here. OpenVR Advanced Settings adds additional settings into the SteamVR environment that allows you to change aspects of games and SteamVR to your liking and convenience. ChaperoneTweak allows you to adjust the chaperone boundaries in SteamVR, as well as the available playspace. This is essential for getting your chaperone boundaries into the correct position and giving yourself the largest available playspace. This page was last edited on 3 January 2019, at 19:03.